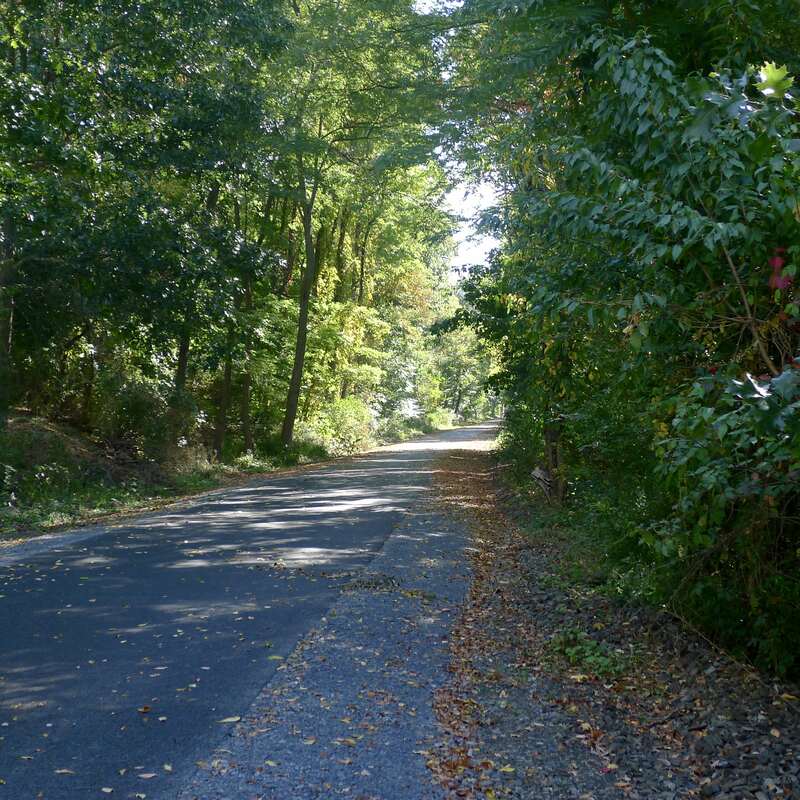 The Orange County Heritage Trail (also called the “Rail Trail”) has run from Monroe to Goshen NY for many years. From the airplane park in the town of Monroe up to the end in Goshen, the official mile-marked trail is about 12 miles long. A few weeks ago, I noticed paving was underway on the section of the trail that connects Monroe with the village of Harriman. That section of the trail is now officially open, and while there are no evident mile-markers, based on the time it took me to walk it, I’d say it adds another 1.5 miles (3 miles round trip) to the trail. This picture shows the beginning of the new section. This part of the trail is mostly forest. The route passes a few homes, but mostly the trail is just a place to observe nature. On a recent jog, I passed the usual chipmunks and squirrels. I also saw two female deer quietly munching on their morning meals. And my sharp eagle eyes also saw young buck curled up in the dappled sunlight at the side of the river. This new addition is a peaceful area to take a morning stroll. Walking and Running: One of the most obvious uses of the Heritage Trail is to take an afternoon stroll or a healthy run. I’ve often passed groups of people who are using their walk as a way to socialize. I’ve also seen many determined athletes focused on beating their last time, or preparing for a marathon. Bicycling: Bicyclists use this trail often. The end to end route is about 30 miles. Biking the route is a healthy way to spend a few hours. Dog walking: The rail trail is a popular place for taking the dogs for a walk. History: Along the full length of the trail are not only corn and wheat fields, a lake and stream, but also some historical sites: There is a saber fighter jet in the Monroe Airplane Park, a restored stone train station and museum in Chester, as well as a cemetery from the 1800s along the way. Official Races: There are often races and charitable walks that start at various spots along the route. 5K runs happen throughout the year. Cross Country Skiing: In the winter, the trail is not cleared of snow. Usage declines dramatically although there are still some people who continue to walk through the winter. However, because it’s basically snow covered, the trail becomes a great place for cross country skis. So if you live in the area and haven’t already spent time on the trail, go for it!